I mean no criticism when I say that wine writing – and blogging in particular – pays a lot of attention to what is going on at this exact moment, and very little to history or even context. It’s only natural, it’s a sign of the times, and it’s definitely tied into the lightspeed of digital communications. But one of the enduring and endearing aspects to wine is its insistence that things not be rushed. The natural time cycles of growth and vineyard ripening cannot be accelerated past a certain point. The same goes for fermentation, aging and bottling. Wine takes time, and the best wines often take the most time. Even finished wines, that have been released for public comment and review, may need more time. That was the point I was trying to make yesterday in this blog. I want to return to Brian Carter’s wines, because they are perfect examples of what I’m talking about. I met Brian Carter more than 25 years ago, when he was making a lively range of wines at the original Paul Thomas winery in Bellevue. Along with the excellent rieslings, chardonnays and cabernets were a most unusual pair of dry wines, made from Bartlett pear and rhubarb respectively. When he left the winery in 1988, its glory days quickly drew to a close. But Carter was just getting going. He continued winemaking and consulting for Washington Hills, Apex, Hedges, McCrea and Kestrel, among others, before opening his own winery in Woodinville a few years ago. The Auction for Washington Wines named Carter its Vintner of the Year in 2007. He is the only three-time winner of the Enological Society’s Grand Prize. His Apex Cellars 2000 Syrah was named the best wine (out of 350) at the Thomas Jefferson Wine and Food Classic, and brought him the coveted Thomas Jefferson Cup. A quiet, unassuming man, Carter wears these accolades lightly. He gets middle-of-the-pack notes from Jay Miller, and, I fear, loses potential points because he favors unusual blends and crafts wines that need more time than most to evolve. Shouldn’t that be rewarded? Well yes, but only if the reviewer takes enough time to notice. It’s now about 8 am on a Thursday morning, and I just tasted through Carter’s 2007 and 2008 Oriana ($24). These are clever blends of viognier, roussanne and riesling. I don’t know of anyone else in the country making such a blend (and neither does Carter). The two wines are differentiated by vintage and bottle age, the 2007 showing more minerality, the 2008 more vibrant, succulent fruit and juicy natural acidity, but both are delicious. And by the way, the bottles were opened at lunch on Tuesday. We stuffed the corks back in and they’ve sat on my counter for almost 48 hours. Last night I revisited Carter’s 2005 Solesce ($58), opened at the same lunch. This Bordeaux blend is his most expensive, last-to-be-released wine. On the day it was opened it was not my favorite – I wrote “tannic, still hard, some heat, iron, black olive, earth...” But after breathing for 30+ hours it had fleshed out, smoothed out, opened up, and lost its alcoholic edge. It is clearly a wine to cellar, and though Carter has given it extra bottle time, it needs still more. Again, I think this should be rewarded. Aren’t muscular, ageworthy Bordeaux the ones we most admire and pay the highest prices for? 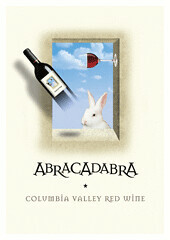 If you want something instantly accessible, try the 2007 Abracadabra ($20), an 8-variety red blend that is bursting with fruit and nicely balanced. Ready to go, but not a front-loaded wine with no finish – this one has the tannins to balance it out. Among Carter’s other wines, I especially liked the Corrida (profiled yesterday) and the 2006 Le Coursier ($30). This latter was previously called L’Etalon but a threatened legal action prompted the name change. It’s the same wine – a Bordeaux blend dominated by merlot rather than cabernet, firm and tannic, with hints of violets and cassis, beautifully proportioned. The grapes are sourced from vineyards in four different AVAs, and the blending is impeccable. Brian Carter Cellars wines are distributed by Vehrs, and may also be purchased at the winery tasting room in Woodinville. If you haven’t tasted them, I’d say it’s about time. Excellent article and brings a question to mind. How does one know how long a wine should breath? Great question. You really don't know - can't know - if you haven't had the wine. You can get a sense of it from that first whiff or taste, but if you are planning a special dinner or tasting and you want the wine at its best, you are stuck guessing unless you know someone who's had it recently. Young wines often need some hours; whereas really old wines sometimes fade within minutes. Wines, like wimmins, are mysterious, and we love them for it. Yes, they are mysterious. Maybe, if appropriate, you could recommend breathing times in your reviews? I do mention, in some reviews, that breathing time or several hours breathing time is recommended. I don't get more specific than that because it adds yet another task to the simple enjoyment of wine. If I had to generalize, I'd say that wine for any meal should be opened and checked an hour or so before you sit down at the table. At that time you can assess its condition, see if it needs to be decanted, or (worst case) replaced with a different bottle. Leaving it out overnight is a technique for assessing its potential lifespan, but not something you would ever plan on doing for a meal.